It's been over 20 years since Jon Krakauer wrote Into the Wild about Chris McCandless' journey into the Alaskan wilderness. There are still so many unanswered questions about Chris' rationale for escaping into the land that eventually takes his life. After years of silence, Chris' sister Carine tells her side of the story and what a crazy story she shares! The McCandless parents take dysfunctional to a whole new level. Although this is Carine's story, she definitely sheds some insight on the abusive childhood she and Chris endured. The spellbinding story of Chris McCandless, who gave away his savings, hitchhiked to Alaska, walked into the wilderness alone, and starved to death in 1992, fascinated not just New York Times bestselling author Jon Krakauer, but also the rest of the nation. Krakauer's book,Into the Wild, became an international bestseller, translated into thirty-one languages, and Sean Penn's inspirational film by the same name further skyrocketed Chris McCandless to global fame. But the real story of Chris’s life and his journey has not yet been told - until now. 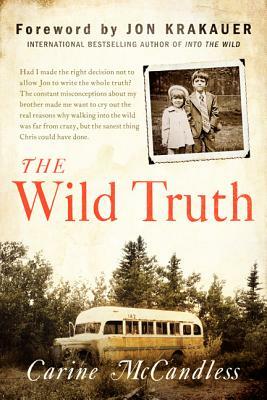 The missing pieces are finally revealed in The Wild Truth, written by Carine McCandless, Chris's beloved and trusted sister. Featured in both the book and film, Carine has wrestled for more than twenty years with the legacy of her brother's journey to self-discovery, and now tells her own story while filling in the blanks of his. Carine was Chris's best friend, the person with whom he had the closest bond, and who witnessed firsthand the dysfunctional and violent family dynamic that made Chris willing to embrace the harsh wilderness of Alaska. Growing up in the same troubled household, Carine speaks candidly about the deeper reality of life in the McCandless family. In the many years since the tragedy of Chris's death, Carine has searched for some kind of redemption. In this touching and deeply personal memoir, she reveals how she has learned that real redemption can only come from speaking the truth. Carine McCandless is an entrepreneur, activist, and mother. She has been successfully self-employed since she started her first business at the age of nineteen. As a public speaker her presentations are featured in education and corporate venues across the United States. She is the sister of literary icon Chris McCandless and consulted closely with Jon Krakauer on his bestselling book Into the Wild. She also worked as a direct advisor and script contributor to Sean Penn for his film adaptation of the book. She lives in Virginia Beach, Virginia with her two daughters.